With a global compound annual growth rate of 32 percent over the past five years, wind power is the world’s fastest growing energy source, and wind turbines are currently installed or being installed in more than thirty states nationwide. The American Wind Energy Association (AWEA) projects that more than 6,000 MW of wind energy generating capacity will have been installed in the United States by the end of 2003, which can produce enough electricity for 1.5 million U.S. households.1 Applications include utility-scale central generation, grid-interconnected, and separately derived systems through distributed generation, battery charging, and direct-drive water pumping for irrigation systems. With this increased use of wind energy products comes the increased probability that sooner, rather than later, authorities having jurisdiction will be faced with the responsibility of inspecting a wind turbine installation. The following article will provide authorities with information regarding the construction, ratings, markings and safety certification of wind turbines, along with the knowledge of how UL certification services for wind turbines can facilitate the inspection of these machines. At a fundamental electrical level, a wind turbine is no different than a reciprocating engine generator set. A fuel source (wind) is converted into mechanical energy (turning the rotor, low-speed shaft, gear box and high-speed shaft), which in turn is converted into electrical energy (via the generator). What sets a wind turbine apart from a diesel generator set is the fact that all of the machinery and most of the electrical equipment are located on top of the tower, which in the case of the largest available turbines today, can be as high as 110 meters (approximately 360 feet). However, there are a number of distinct characteristics of wind turbines that bear mentioning here, as they relate to the unique terminology used in the wind industry and the determination of a suitable installation. The following definitions are taken from IEC 61400-1, the Standard Wind Turbine Generator Systems, Part 1: Safety Requirements, 2nd edition, dated 1999-02. Nacelle is the housing that contains the drive-train and other elements on top of a horizontal axis wind turbine tower. Refer to figure 1 for a simplified wind turbine nacelle configuration. Swept area is the projected area perpendicular to the wind direction that a rotor will describe during one complete rotation. Reference wind speed (Vref) is the basic parameter for wind speed used for defining IEC wind turbine classes. A turbine designed for a wind turbine class with a reference wind speed Vref is designed to withstand climates for which the extreme 10 min. average wind speed with a recurrence period of fifty years at turbine hub-height is lower than or equal to Vref. Extreme wind speed is the highest average wind speed, averaged over t seconds, that is likely to be experienced within a specified time period of N years (“recurrence period”: N years). The IEC standards use recurrence periods of N = 50 years and N = 1 year and averaging time intervals of t = 3 s and t = 10 min. The turbine is designed using extreme wind speeds for design mechanical load cases. The actual measured average wind speed at the specific installation site must be less than the design extreme wind speed to ensure a suitable turbine installation. 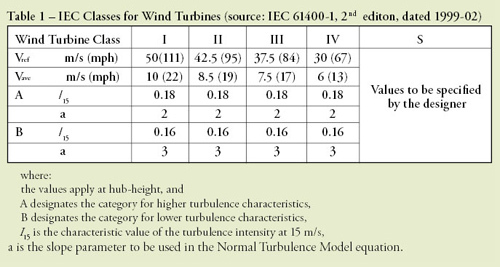 IEC wind turbine classes are standardized wind regime parameters segmented by wind speed and turbulence values. Refer to table 1 for details. Wind turbine designs that do not conform to a standardized class are considered special designs and are marked as Class S. The wind regime parameters for which a Class S turbine is designed must be specified by the turbine designer and marked on the product by the manufacturer. Frequency at the wind turbine terminals or frequency range in the case that the nominal variation is greater than 2 percent. This information, coupled with the complete product certification information, should enable the authority having jurisdiction to verify a suitable installation of the wind turbine with respect to mechanical, electrical and personnel safety hazards. Series of Standards for Wind Turbines, but incorporates site-specific technical requirements that are dictated by the model U.S. installation codes, such as NFPA 70, the National Electrical Code (NEC). The IEC 61400 series of standards contain detailed mechanical and electrical safety construction requirements and safety and performance testing for wind turbines. UL currently classifies these wind turbines for compliance with the IEC 61400 series of standards. In addition to meeting the product requirements set forth in the IEC standards, UL evaluates the influence of the model electrical and building codes, as well as the relevant OSHA personnel safety codes, in the product evaluation. Detailed review of the manufacturer’s installation, operation and maintenance instructions is also included in the UL classification evaluation. The end result is a certified product that can be installed in accordance with applicable model codes, i.e., no different than any other type of permanently installed equipment certified by UL. There are two distinct types of wind turbines: large, utility-scale turbines and small, distributed generation turbines. All wind turbines consist of a foundation, tower, and nacelle (containing the generator, rotor and blades). Interconnected wind turbines rely on an external inverter for safe connection to the utility grid. For more information on inverter safety and performance, refer to the article titled “Utility Interactive Inverters—Key to Unlocking Alternative Energy’s Future” in this issue of IAEI News. Small wind turbines are currently defined in IEC 61400-2 as having swept areas less than 40m2, and are typically installed alone or in a hybrid system with solar panels or small diesel generators, and are owned by private businesses or homeowners. UL classifies these turbines under the product category Wind Turbine Generating Systems, Small (ZGYW). UL’s classification program for small wind turbines uses a combination of the Standard for Safety of Small Wind Turbines, IEC 61400-2, and the relevant UL product standards for components of the turbine. Consideration of the installation codes, especially the NEC, is also included in the certification process. IEC 61400-2 contains requirements for the electrical and mechanical safety of small wind turbines. As with many products, the electrical evaluation focuses on reducing electrical, fire and shock hazards. The mechanical evaluation focuses on the wind turbine’s ability to withstand the mechanical stresses inherent in its operation. Turbines are rated not only in power output (volts, amps or wattage) but also with wind related ratings. Operational ratings include cut-in and cut-out wind speeds, and extreme wind speed ratings. This means that, in addition to proper electrical installation (e.g., the output wiring is sized correctly for the intended current), an AHJ will need to confirm that the wind turbine is also installed in a location with a wind resource that does not exceed the design limits of the turbine. The wind resource is a meteorological measurement of actual wind speeds averaged over small time frames (typically 10 minutes) and wind directions. Maximum wind speeds are also captured for time periods as short as one second. When an AHJ is asked to approve a wind turbine installation they should consider (in addition to the normal electrical and structural installation requirements) both the average and 50-year extreme wind speeds for the specific site. This information should be readily available from the site developer or turbine installer. Very few permanently installed electrical products afford us the chance to walk inside of the product enclosure, but wind turbines not only afford us this opportunity, but also require personnel to enter the product for installation, operation, maintenance and servicing. Large wind turbines are currently defined in the IEC 61400 Series of Safety and Performance Standards as having a swept area of greater than 40m2, are typically installed in groups called wind farms, and are owned and operated by electrical utilities. Some of the larger wind turbines have electrical lifts that can carry personnel to the top of the tower, but most are still only provided with a ladder for the service crew to ascend. Since the physical size of these products enables entry into the product, UL has incorporated many of the NEC requirements for electrical installations into the certification evaluation. For example, although no working space requirements are specified in IEC 61400-1, the requirements specified in NEC 110.26 are verified in the nacelle prior to extending UL certification for a large wind turbine. 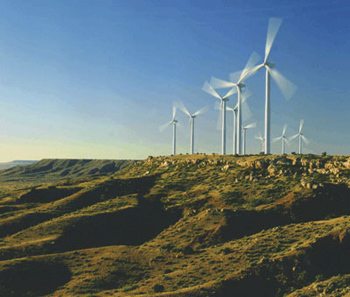 UL classifies large wind turbines under the product category Wind Turbine Generating Systems, Large (ZGYZ). UL also classifies sub assemblies such as control panels under the product category Wind Turbine Generating Systems Subassemblies (ZGZJ). The UL guide information for these categories can be located in the General Information for Electrical Construction Equipment Directory (the White Book). The UL guide information and classifications can also be located in the UL Electrical Construction Materials Directory (the Green Book) as well as online atwww.ul.com/databaseand entering the four-letter category code at the category code search. On the surface, the inspection of a wind turbine can appear to be a unique and vastly different task than that faced by authorities having jurisdiction every day. But if you delve deeper into the situation, the uniqueness of inspecting a wind turbine diminishes quickly, with the main difference between wind turbines and traditional power generation products being the need to verify suitability of the wind turbine’s design limits with the installation site’s environmental characteristics. 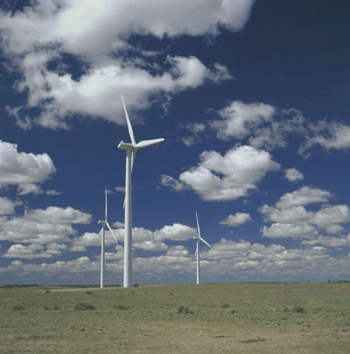 UL certification services are available for wind turbines, like most electrical products. Certified small wind turbines are commercially available and their installation is much the same as any permanently installed electrical product. Large wind turbines, due to their size and the ability for personnel entry, may appear to be different, but they too are subject to certification, rendering them no more than a very large permanently installed product. So the next, or first, time you are faced with inspecting a wind turbine, look for the UL mark signifying the product’s compliance with international safety standards, and rest assured that the partnership you have come to expect from UL also applies to these new products. To make electrical inspections on wind turbines and all distributed generation equipment easier for AHJs UL has included a list of all distributed generation (DG) product categories in the front of the General Information for Electrical Equipment Directory (the White Book) on page xix. Also, for more information on wind turbines and distributed generation equipment in general, be sure to visit us on the web athttp://www.ul.com/dge/.